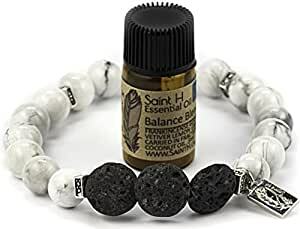 The Saint.H Howlite Lava Bead Diffuser Bracelet is the elegant and attractive way to carry your favorite Essential Oil with you at work or play. White with delicate grey veining, having a similar look to carrara marble, Howlite carries a timeless and stable feeling. And luckily for us, looks great paired with anything! I love this little bracelet, goes with everything I wear and the essential oil that comes with it smells so good. 1.0 out of 5 starsVery disappointing. Very disappointing. The beads were too small and the oil was in the smallest bottle possible. I had received a different one as a gift and thought the one I was purchasing was the same thing. Today I saw a nice one at craft show and it was bigger and a third of the cost. I won't buy from this seller again.